August 29, 2017 – A Duke University Health System initiative to reduce antibiotic use by 20% has exceeded its goal as part of a national education project encouraging health care professionals to adopt appropriate-use criteria for the class of medications. Funded by a grant from the American Board of Internal Medicine Foundation, the effort began by focusing on the use of antibiotics in treating acute bronchitis and upper respiratory illness. The project is being led by Alyson Shogan, MD, a recent graduate of Duke’s Internal Medicine/Management and Leadership Residency Program, and Devdutta G. Sangvai, MD, executive director of Duke Connected Care and the Population Health Management Office. “Before the initiative, and after careful review of data, we determined that the number of antibiotic prescriptions written for bronchitis and upper respiratory illness was higher than expected,” Shogan says. Recognition of the issue has resulted in improvements. In the second year of a 3-year grant, antibiotic use for acute bronchitis decreased by 24%. The appropriate-use initiative is helping drive that reduction, she says. When the grant was awarded in 2015, the planning team brought together leaders of emergency care, urgent care, primary care, and other clinical service lines to identify effective tools to encourage appropriate use of antibiotics. As a result, new measurements of antibiotic prescriptions are in place, and some provider incentives are based on lower prescription totals. Performance measurement for some clinics now includes appropriate use of antibiotics. To sustain the educational effort, lunch-and-learn sessions have been held at select Duke clinics. Print materials and screen savers serve as reminders for both clinicians and patients. “This program really hits the bull’s-eye in terms of responding to a problem we all know about and need to address because of the risk of antibiotics’ side effects, the potential of superbugs, and the rising costs of responding to them,” says Shogan. The grant is overseen by Choosing Wisely, a national educational partnership with Consumer Reports that was created to kick-off dialogue about ways to avoid wasteful or unnecessary medical tests, treatments, and procedures. In addition to Duke, 5 other North Carolina institutions are participating: NC Health Care Quality Alliance, Cornerstone Health Care, NC Medical Society, NC State Health Plan, and BlueCross BlueShield NC. By reducing the use of unnecessary or potentially avoidable tests and treatments, Duke Health leaders intend to improve the care their patients – and all North Carolinians – receive. To achieve that, the Choosing Wisely effort led by the North Carolina Healthcare Quality Alliance, with Duke as a key participant, aims to improve patient and clinician education, transform system processes, and foster community-based dialogues between patients and clinicians about making smarter health care choices. Duke places a special emphasis on engaging physicians at the beginning of their medical careers. In many of its residency programs, a high value care curriculum is implemented through a series of lectures with interactive cases, delivered by inpatient and outpatient division faculty. 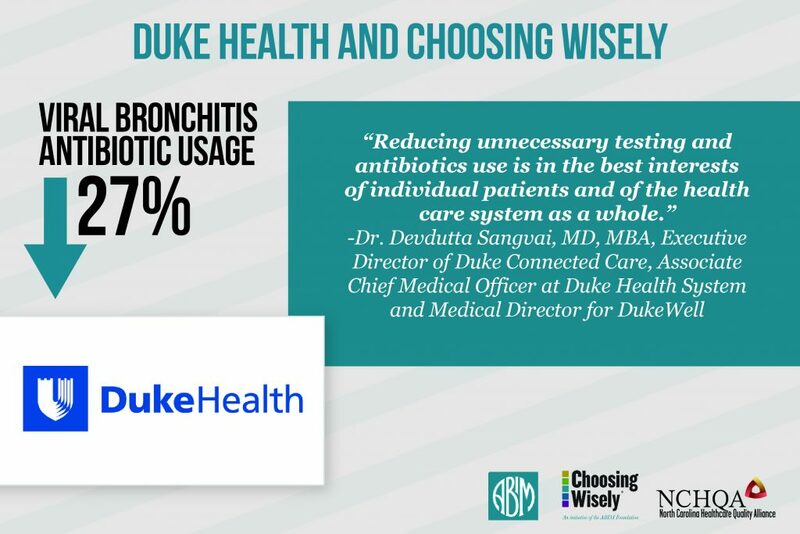 Duke is using the three services selected for this grant as specific case examples and the curriculum has been the basis for two program-wide initiatives under the Choosing Wisely campaign.